This Avocado Ranch Dip is a healthier version than your everyday ranch, and it has a hidden vegetable: cauliflower. 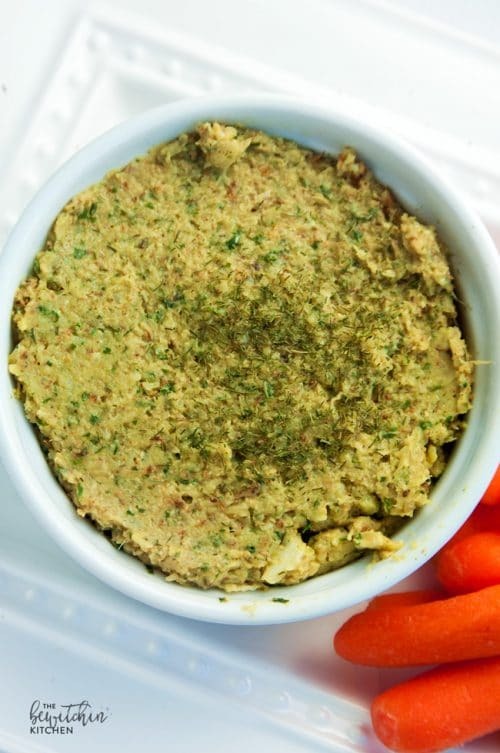 This makes a thick dip, a hummus consistency, if you want it thinner add more red wine vinegar but I found this easier to pick up with carrots (it also makes a great spread for sandwiches). It’s no secret that I’m a fan of Vitamix. 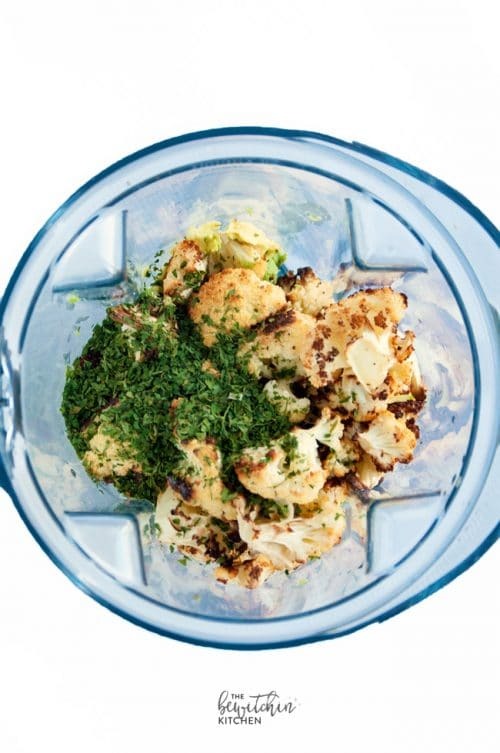 My first Vitamix was the S30 and with that, I brought you the recipe for Roasted Cauliflower Dip. It’s a great little machine but I had issues making homemade Larabars and coconut breakfast balls, I needed more power. Enter the Vitamix 7500. This bad girl has a 2.2hp motor base, which will blend any whole food ingredient. So what does that mean? MORE POWERThat means you can make your own nut butters, granola bars, soups, and you can make them fast. In fact, here is a list of foods you can make with the Vitamix. Other features of the Vitamix 7500 is a low profile 64-ounce container. This container is massive and holds a lot, all while fitting snuggly under your kitchen cabinets. Those are all great and all but I love how easy it is to clean! There is nothing to take apart and you simply blend water and a drop of soap for a minute and rinse. That’s it! Okay guys, I’ll be the first admit that this isn’t the prettiest of recipes, but it’s super tasty. 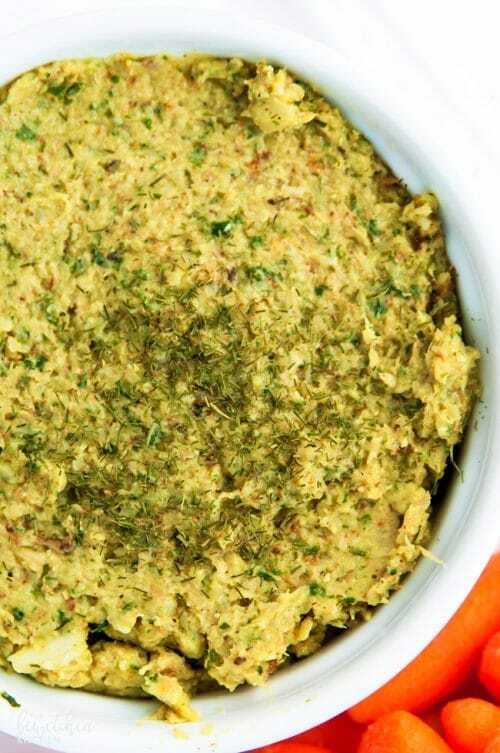 I love the zest of the red wine vinegar and dill and the fact that it’s quick and easy to whip up makes this avocado ranch dip a winner in my books. Want a Vitamix? Yes, I know you do – it’s so awesome. I recommend buying directly from the Vitamix website. If you like this, then you’re going to love this simple homemade guacamole recipe. Looking for a healthy dip recipe? 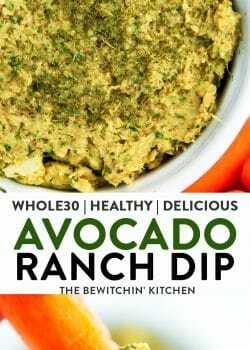 Check out this Avocado Ranch Dip. This appetizer is Whole30, Paleo and loaded with veggies and healthy fats. The secret ingredient? Cauliflower! Break off the head of cauliflower into florets and lay on a baking tray. Drizzle olive oil and season with salt and pepper. Roast for 35 minutes. Let cool. In a Vitamix add all of the ingredients and blend until smooth. Serve with raw veggies, crackers, or use it in place of mayo on a sandwich! I would use the vitamix to make soup this would be amazing. Been watching the demo’s since I was like 5 and have always been amazed how simple and Delicious the different dishes can come from it. I would make smoothies and soups. My friends who have one rave about it! I would use it to make peanut butter and smoothies. My hubby is a chef and he wold love to have a vitamix! Right now we just have one of those cheapie blenders, and just doesn’t satisfy his creative needs. I know my tastebuds would be excited to give this blender to him ! My tastebuds thank you for this awesome opportunity to win a Vitamix! Good luck Karly! It’s such an awesome machine. I would definitely use it most for soups in winter and smoothies in summer – Ive heard such great things about vitamix! This recipe looks super yum! 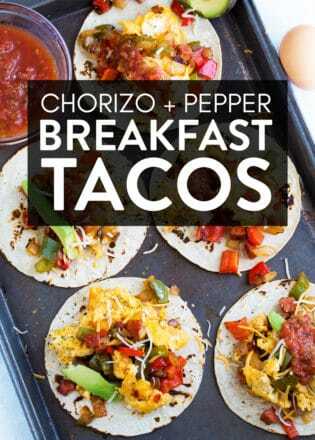 And I love that it doesn’t have cilantro like so many other avocado recipes (I have taste bud issues with cilantro). I would use the vitamix for my daily smoothies, as well as many, many pots of delicious soup. I put cilantro in things sometimes, but it has to be light. I’m not a huge fan of it myself. I’d use it most for morning smoothies, and they’d be a whole lot healthier than my current ones with this amazing machine! Thanks for the chance. Peanut BUTTER Milkshakes would be anice often concoction at our house! I would use this to make pesto and smoothies. I would use it most for making soups. 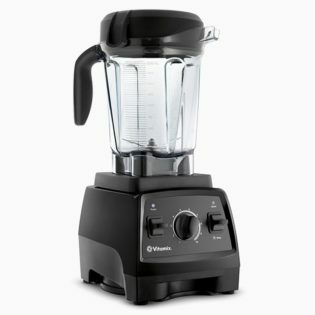 I would use the Vitamix the most for making drinks, including smoothies, juices, milkshakes and cocktails. Soups and smoothies and nut butters! I think I would be using the Vitamix the most for green juice. I’ve wanted a Vitamin for years! When I bartended this was the only blender that actually lasted. We went through so many blenders (and not cheap ones!) before the owner invested in this beauty. It made amazing blended drinks and could handle the strain constantly running on a hot day. It lasted years and was still going strong when I left. I would definitely use it to make blended drinks and smoothies. I never thought about it for ing sauces and soups until reading your posts, I would live to try it. I would use this Vitamix to make healthy smoothies in the morning! would love touse it to make smoothies, soups and sauces. We would use it for soups, especially in the winter. I would make soups! With this cold right now soup sounds so good! 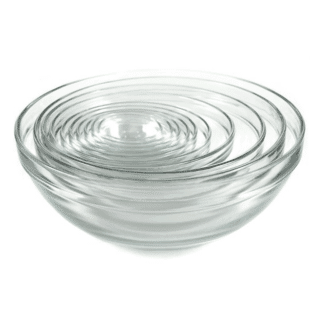 Perfect for soup, smoothies and hummus. 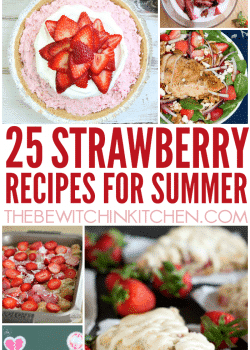 Mostly for smoothies, but would love to try out your recipes! I would make ALL the kale smoothies! I would use it for smoothies!! I would use the Vitamix most for smoothies and soups. I would use it to make smoothies, baby food, and soups. I would use this blend the most for homemade soups! I would use it for lots of things but smoothies sound yummy! I would make breakfast smoothies, fruit smoothies, and soup! What a great product this is! It would be used mostly to make lots of green smoothies. Oh so many things from dips to smoothies and this time of the year soups too. I would probably use it the most to make smoothies, followed closely by soups. PS, I disagree with your son. You know how to cook 🙂 That is one yummy looking dip above. The thicker the better I say. Haha! Well I’m glad you disagree. Yes, I add spinach sometimes to my smoothies because I don’t get enough veggies and this makes soups too! I do think next time I make this dip, I will add more vinegar just to thin it a bit. Soups, Nut butters, dips as probably a hundred other things! I would use it to make green smoothies. I would use it to make green smoothies and cauliflower soup. I would use it to make fruit smoothies. Smoothies, Soups, Dressings, and Sauces would all be on my list if I win this awesome machine! Sounds delicious! And a vitamix would be a great addition to my kitchen! I think for me I would make smoothies and sauces the most. Green smoothies for a healthier 2017! Wow, what an amazing giveaway! That guac looks delicious, so I’d definitely try that out, and lots of soup! I would make all kinds of healthy delicious smoothies for my family. Pumpkin purée for homemade pie. Nut butters. I would love to make healthier smoothies for my family and I!! I. Would make green smoothies and almond milk! I’d use it for making dips! I have been coveting a Vitamix for years! Would probably use it most to make soups & nuts butters. Oh, and smoothies! I would use it mostly for soups but would like to make a lot more homemade sauces. I would use it daily for smoothies but I would also like to make my own almond butter. I would use this Vitamix to make falafel. What can’t you make in the Vitamix?! I would use it for everything! I am always lusting after them when I see them at Costco! I would make the ice cream, soup, etc. I would use this blender mostly for smoothies, but also for creamy soups. I love soups all year long. I would use this the most for soup and smoothies. I would use my Vitamix to make smoothies and shakes. I would use the vitamix to make soups! Especially now since its so cold out!! I would use it for smoothies soups and sorbets! Even salsa! All the declious “S” foods lol ☺️ Wish I had the money I’d buy one right now! I would mostly use it for smoothies but I have been wanting to make my own nut butters and the results in my current blender have been blech! I would use a Vitamix to make huge amounts of delicious soups! Would LOVE to win this. I would use it for all the suggestions, but probably mostly doughs and batters. A vitamix has been on my wish list for a long time! I could use it for so many delicious recipes but especially smoothies. I would probably use it the most for cream soups but a close 2nd would be smoothies and dips! I’ve been wanting a Vitamix forever, so I would love to win this. I can think of so many ways I would use it, but nut butters, homemade mayo, soups, and smoothies would be right up there. I love your dip recipe with cauliflower. It sounds delicious as a sandwich spread! I love Vitamix! i must try this dip! I would use it to make my morning smoothies. I would use the Vitamix to make smoothies and soups the most! I would use the vita mix for making more than one shake at a time each morning. It will same alot of time making them all at once. I would use it the most to make soups. I make smoothies all the time. I’d use it the most for that. i would love to use it to make fruit smoothies in the mornings for my family! I have some ideas for nut/seed butters but my current blender isn’t powerful enough to make them smooth. Would LLOOOVVVEEE to try this one! Thanks for the chance to win! I would use it most for chopping up the ingredients for my soups. I wound make smoothies every single day! I would use mine mainly for sauces and dressings….I am a sauce freak !! I’ve recently had to go gluten free for health reasons and think that the vitamix would help create quick soups and smoothies for my family. I would make a lot of smoothies with it. I would immediately make some nut flours. I’d do smoothies and soups all the time. I would use the Vitamix the most for soups and dips ! Wow, love Vitamix very good to make your Dips !! Some nut butters and soups! I would love to win! We would use it for soups and smoothies! I’d enjoy a good peanut butter milk shake but will make other types of smoothies as well. I’m not sure, but I’m thinking soups for starters. I think I would use it mostly to make soup. I love to cook and make lots of different homemade soups. I would use it mostly for making soups and smoothies. I love to make both sweet and savory sauces to enhance my dishes so this would be a huge help especially with the consistency. I’d use it the most for making kale smoothies! I have always wanted to get one! I would use it to make smoothies and soups. Fingers crossed I win this. I would use it to make soups and smoothies. I would love to try making almond butter and grinding flours! How exciting. When I click on follow @soberjulie it shows that I follow, so I clicked that as an entry, but when I go to twitter it states that I am blocked. Hey Jan, I sent you an email explaining how we can fix this. A good blender is the secret to amazing soups – I would love to win! I think I’d use it most for smoothies and soups. I would use it for everything! I grew up making smoothies with my moms old vitamix and I miss it so much! I have always wanted one since they came out just couldn’t afford it. I would make soups and smoothies the most. I would create some great hot soups. It would be put into action at every opportunity – soups, smoothies. Oh, making soup in a Vitamix sounds like fun! And hummus, of course I’d make creamy hummus! I would mostly use the vitamix to make healthy and delicious smoothies but I would also be very interested in making soups and dips with it too. I would use it for soups, ice cream, and smoothies. This might be a duplicate but I do not think my post posted. I would finally have the perfect appliance to make the awesome smoothies that I have been researching and craving!! I would use it for smoothies and soups! to make soups and smoothies and dips and so much more! I would use the Vitamix mainly to make healthy smoothies, but would also make hummus and dips. I would use it for everything, smoothies, dressings, soups etc. I would love to use the Vitamix the make all sorts of healthy soups for my family, and also homemade garlic hummus because we buy a lot of it from the store & I would rather make it at home. I would use it for my homemade sauces and syrups. this would be a toss up between fruit smoothies and pureed winter soups! I would use the Vitamix for sauces & soups. Thanks for this contest! This would be great! I would use it the most for soups. I am vegetarian and would use it for a great many dishes. I would love this to make a smooth butternut squash soup, I just got a great recipe from a friend. I understand you can make nut milks and butters easily with a Vitmix too. I would absolutely love to have this for making soups. I know my hubby would love it for his nutrition drinks. I love to make homemade salsa and smoothies!!! I would use it to make breakfast smoothies with oatmeal and fruits. I would use it to make different things like protein shakes or batter for protein pancakes. I would us it to make smoothies. Smoothies, soups & blender drinks! I would use it to make smoothies for breakfast. We would use this for veggie juices and fruit smoothies, my son is into the healthy options so this would be awesome! I would use it for smoothies and soups to start. I would use it for making my morning smoothies and dips. I would give it to my husband to use at his office. I think he would make smoothies and soups mostly. I know my family would use it most for smoothies, but I personally would love to use it to purée soups! I love making green smoothies and juices! I would use it to make protein shakes. I would also use it for soups and baking. We would use this for fruit smoothies and milkshakes! Smoothies would be the first thing i would make. I would use it utmost to make my soups and shakes. I would use it for many different things but definitely for soups and smoothies. I would use it to make soups, yummy. Whatever my girlfriend wants to use it for; she’ wants one. I would make smoothies, hummus, soups and veggie dips. I would use the vitamix the most to make baby food. I want to make hummus and butternut squash soup! I would use it for a lot of things, smoothies being the most. I would use it most often for making smoothies. I would use it most to make soup and hummus. I would love to use this for so many things! I really would like to start making my own almond milk. I would use it to make all sorts of dishes. From smoothies to soups. I would make everything. From smoothies to soups. Probably its primary use would be for different things over time, but I see, for beginning, ice-cream shakes and fruit smoothies. That’s what I’m using it for, most of the time. Today I’m making meatballs though! I would use this to make delicious smoothies for me and my family! I would use it for soups, and my husband would love to use it for smoothies! I want to try making peanut butter – and of course smoothies. I would use it most to make dips and mixes. I would use the Vitamix to make soup. I would use the Vitamix to make smoothies for breakfast! I would mostly use it to make my smoothies… The blender that I have now doesn’t work that well. I would use the vitamix to make smoothies!! I do a lot of my own cooking. I would mainly use it to make my garlic & ginger paste, blend onions & tomatoes. Make salsa. Also a few healthy smoothies. We’d use this the most for cocktails, especially daiquiris. I would use it to make yummy shakes & smoothies with kale, chia, bananas, almond milk yummy! I would use it for smoothies. We drink a lot of those. I would use it for soups and smoothies. I would use this to make homemade salsa. I’d definitely use it for smoothies. I make a lot of smoothies and would put this blender to good use! I would use this Vitamix most for green smoothies, but the blending possibilities are endless. I would use the Vitamix to mix cookie dough, knead pizza dough and blend breakfast shakes and cocktails. No doubt, this would be most used to blend up the protein shake I have every day! I would use it to make healthy blueberry smoothie to get well & healthy again. I would use it to make smoothies mostly. I would use the Vitamix mostly for dips for parties and smoothies for breakfasts. I would use the VitaMix for both smoothies for breakfast and lunch and making soups. I think the soup feature is the coolest thing. I would use the Vitamix for soups and smoothies! Great prize. My son would love the smoothies for sure. I would use it to try out new smoothie recipes. It would be soups, smoothies and I would try all kinds of interesting new things. Thanks for the chance to win. I could make some protein smoothies, thank you so much for the offer! I would use it most often for my husband daily green smoothie. It would also be used to finish soup, and make almond meal or almond milk. I would make all the baby food I could. i would use it most for making smoothies and hot soup! This is my required comment. I would use it to make your avocado ranch dip and also hummus! Definitely my morning protein drinks! my morning smoothies for sure, then we’ll see where we go from there. I think it would get most of its usage for making smoothies. I would use it for more smoothies so I might actually eat breakfast. I would love to use this blender for fresh smoothies with spinach, apple, and orange juice. A smoothie is a quick breakfast that can be packed with a lot of vitamins. I would use it most for making smoothies! I would use it mostly for smoothies. I would be using it mostly for smoothies and shakes. I would love to make soups in it. I would use it to make smoothies for the kids! I would probably use it most to make really creamy smooth soups! I would love to start juicing, so I would probably use it the most for that and smoothies. 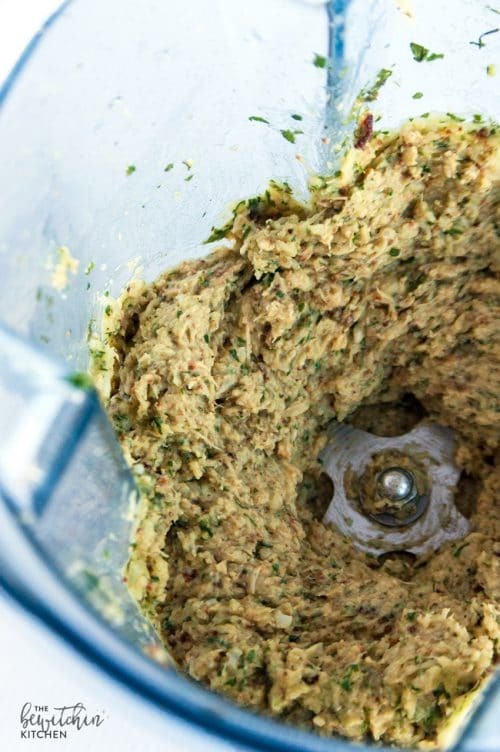 I miss having a machine that is good enough to make perfect chicken liver pates, vegetable soups and spreads. I’d also use it for creating flavoured olive oils and the bases for freezer ice creams. I would use it to make smoothies the most. I would use this vitamix for making soups and smoothies! I would start with smoothies and then move on to everything else . I would use the Vitamix most probably for making soups but I would continue to experiment in making smoothie and other fun off the tip of my head concoctions. I would use the vitamin the most for making smoothies! I would the Vitamix to make my daily smoothies. My boys and I would use this for smoothies the most. This blender would make a great addition to my bar. I am a smoothies for breakfast kind of girl. I would use the vitamin for making smoothies . i would use this great machine to make smoothies and soups and fresh peanut butter!!!! I would use it to make my daily smoothies! I would like to make veggie soup in this vitamix.. I would make so many different things with this blender! From soups to smoothies to making dips and sauces. Thanks! I love making hummus in my blender, but it’s not a great one, so the texture never really gets as smooth as it should. I can’t wait to try hummus! I recently used my Vitamix to make meatballs and they were a huge hit. Would probably be smoothies. I’d also make dips and soups. Maybe icecream too. I would use my vitamix to make green smoothies every morning! Smoothies, raw ice cream and nut butters to start! Yummy! Thanks so much for the chance. I think I would use the vitamix mostly for smoothies and juices! I want to make the coconut breakfast balls, plus lots of smoothies! I think I would use it most for smoothies and beverages. One of my favorite things to make is homemade tomato soup, so that’s what I would use a Vitamix blender to make if I won. Happy Holidays! I would use it for fruit smoothies! I make smoothies every day for breakfast so I would use it most for those. I would mostly use it to make big, thick smoothies. I would use it for smoothies. I’d use it most for smoothies in summer, and soups in winter! I’d use it most for smoothies! I love soup so with this i’d finally try making all those recipes I have saved on pinterest. I would use it for everything! I’d definitely use it for smoothies, cheesecake fillings, and soups to start with. I would love it for my morning smoothies! This time of year, healthy veggie packed soups. When spring hits, smoothies & cocktails. Smoothies and Purees for my son. I have to find ways to sneak more Iron into his diet. I would definitely use it the most for smoothies but I also love making nut butters! I would use the Vitamix to make green smoothies for my family. I’d make mocktails with Sober Julie. The possibilities are endless…dips, sandwich spreads, shakes, facials, desserts, soups, and experiement with all veggies on sale. I would make after school smoothies for my Grands. My go to holiday snack is hummus so I’d make that first! YUM! Sounds amazing Sarah, I love hummus. Okay, I’m intrigued! I need to try plantain rolls! 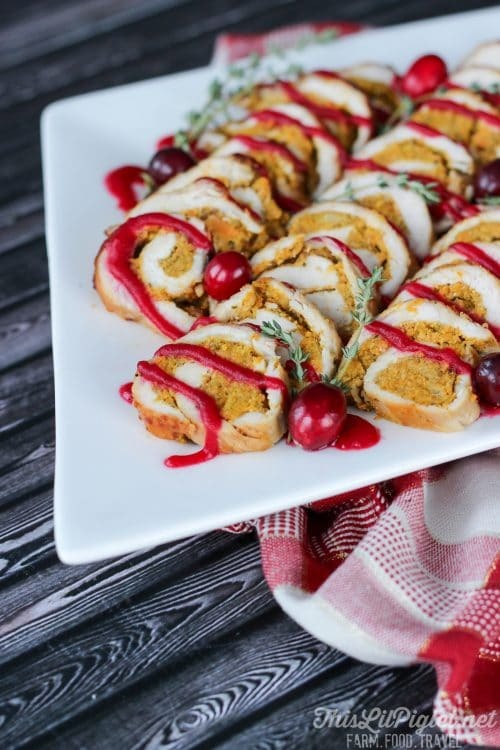 Hors d’oeuvres for dinner parties! I would use it for my daily smoothie. My 20 year old blender has seen better days and close to on its way out. i would use it to make smoothies with. I would use the Vitamix for thick smoothies and ice cream!! I would use the Vitamix most for juicing, smoothies and making soups (as I make soups 3-4 days/week). i stumbled across your blog when I searched whole30 in twitter. What a great giveaway! Pick me! Pick me! Good luck Kathy 🙂 Thanks for coming by. I would use it most for making soup. I would love using it for winter roasted veggie soups! We would use it for smoothies the most…greens for my husband, yogurt and fruit for my kids. Soup would be on the top of my list. Oh, that Avocado Ranch Dip sounds delicious. I didn’t know that you could use cauliflower like that. Cool! I would love to make smoothies, soups, dips, anything that can be made with the Vitamix! I think most importantly, I would use it to puree my 4 year old son’s food as he has issues with texture and it is difficult to get the consistency right with my old blender. Maybe this would be the perfect thing for us! 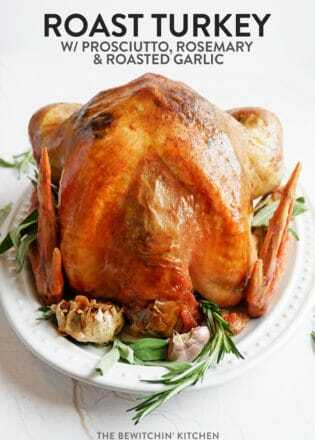 Thanks for the great recipe and review! I would use it to make my morning smoothies! I would mostly use the vitamix for making smoothies and nut milks! I’m going to try a nut milk soon! I would use this Vitamix for making soups! I’d love to be able to make them so much easier! 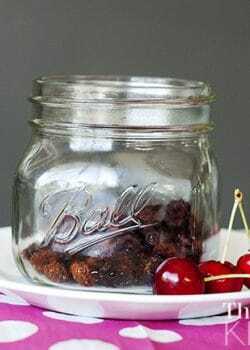 I would use it for hummus, smoothies, and for marinades, like for beef jerkey or steak! I would use it the most for smoothies. But also soups, dips, BBQ sauces and hot sauces. I am starting to eat healthy and would use this all the time. I would do a lot of smoothies, and soups. I think I could make such great creations, which is important because I really like food. So I have to find ways to make it exciting or I will fail at my “diet”. I would use the Vitamix most for making banana nice cream. Melissa, it liquefies spinach so well! No chunks leftover! I would use it the most for my morning smoothies! I would use it for the 3 S’s. Soups, shakes and smoothies. Thanks! smoothies as I could add superfoods and they would be smooth!! I’d love to use it for soups and hummus. It would be fun to make pizza hummus for game days. I would use it for making smoothies and soups! Love the idea of making a dip with the blender. I’d love to try my hand at making some nut butters with the blender. I would use it for smoothies for the family. I would definitely use it he most on myself but also on my kids as well! Thanks so much for the opportunity! I’d use it for smoothies. I would use the Vitamix for smoothies and soups. I would use it the most to make myself breakfast and my kids smoothies and things like that. I would experiment with it alot!! To make Dips and smoothies! Will use it mostly for fruit shakes and smoothies! Definitely smoothies – but I’ve been dying to try making soups in one! I would use this to make all kinds of things but probably mostly smoothies! I would use the vitamix most for making breakfast smoothies. I would use the Vitamix mostly for sauces, pure’s and salsas. I would use it most for healthy smoothies. I would love for tomato soup and smoothies. I would use it mostly for smoothies and sauces for the family. I would use this to make ALL the smoothies. I would make smoothies and soups the most but would try to make peanut butter. breakfast every single day before work! Thanks so much for the chances to win. I would use it mostly for smoothies! I’d use it to finally start making my own smoothies. 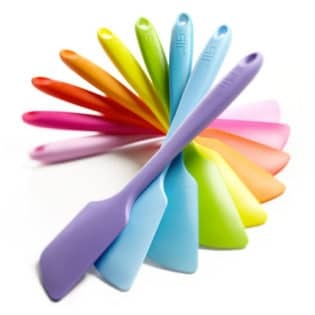 For making soups and smoothies! I would use the vitamix to make more smoothies. The blender I have right now does an ok job but they are still more chunkies instead of smoothies. I’d make many smoothies, nut butters, cocktails, soup and MORE! I’d use it the most for healthy morning smoothies. I would definitely make smoothies! Kale and other leafy greens don’t blend too well in my current blender and I know the vitamin can. I would try to make soups, dressings and get as creative as possible. Thank you for offering such an amazing giveaway!!!!!! Ever since I heard you can make soup with this I was hooked!!!! The budget hasn’t allowed me one yet…. but who knows I must just win one!!! Oh and I can’t wait to try your Avacado Dip! I’d use the blender for everything but mostly hummus and smoothies. Id love it for making healthy shakes and smoothies in the New Year!! I would make morning smoothies with it. This would help jumpstart my new years resolution of getting healthier too! I would use it for soups! I would most often use it for breakfast smoothies, but I’d also use it for soups and dips and….sorbet! I would love to make yummy smoothies and also breaded chicken with it! I would use it the most for smoothies since our family love it! I would use it to make smoothies!!! Smoothies, soups, dips, fillings…. so many uses. I would use it the most for smoothies for my baby girl and I! I’d use it most for protein shakes/smoothies and ice cream. I definitely use it for smoothies, but I’d also use it to make flours out of whole grains, and try different dressings too! I would use my Vitamix for smoothies. would use the vitamix to make smoothies for me and my family to enjoy. I would make fruit smoothies. I would use the Vitamix mostly for making smoothies and soups. This blender would be incredibly helpful when making my roasted butternut squash and apple soup! Smoothies. I have one every day. I would use it for smoothies for myself and milkshakes for this kids. Thanks.. I would use it most for making fruit smoothies! Mostly it would be used for smoothies – but I would also make sauces and dressings fairly often! I’d mostly use it to make protein shakes / smoothies. I would use this to blend my power smoothies to start my day, each and everyday! I would make smoothies, but I would also make some margaritas for special occasions! My daughter and I would be making lots of smoothies, for sure! Wow that dip looks delicious. I would probably use this most often for my smoothies each day and my juices that I make. I would love to also try out some salsas and soups in this. This would be so awesome! I would use the blender for so much! I love smoothies and would love to be able to make vegan smoothies with ease. Also dressings! I want to make homemade salad dressings. I have heard wonderful things about the Vitamix, so I would like to use it. I would use this mostly for making smoothies and also snack bars or balls! I would makes lots of soup during the winter months. I use it mostly for smoothies. I would use it to make soups, falafels, hummus, all kinds! I would use the blender to make milkshakes/smoothies. I would us it to make soups and salsas. I would use it for smoothies, hummus, and marinade mixes! I would use it for making smoothies. So many things,, but I would defintly make lots of smoothies with it. I would probably make some kinds of yummy dips and spreads! 🙂 Something with cheese maybe, and garlic and herbs?? And smoothies – I do love smoothies 🙂 Mango, strawberry. raspberry. YUM! I would use this for a daily smoothie. I would use the vitamix for smoothies and hummus. I would love to have a blender for making smoothies and frozen coffee drinks.